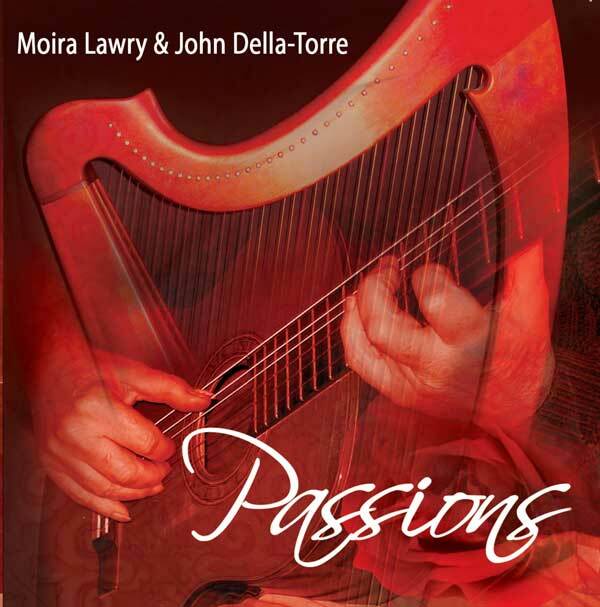 Following the outstanding success of Moira Lawry's CD "Harp for Mind, Body and Spirit" Moira has continued the musical idea of Celtic harp and classical guitar with a new album. Passions is a fusion of unique musical personalities combined to produce a perfectly blended and integrated performance. A passionate marriage of the Celtic Harp and the Classical Guitar. A window opened on a new world of sonorities through a beautiful repertoire of Latino, Baroque and Celtic music. Linda Rankin has fused her Scottish and Celtic roots into an eclectic combination of trad-folk and folk-rock, with a touch of blues, more than a hint of jazz and tastes of Indian and Latin which make for a musical experience unlike any other.Chris Finnen's guitar genius combines expertly with Linda Rankin's atmospheric and hypnotic fiddle playing, while Stephen Moribito's dynamic, yet highly interpretive percussion, Phil Vidinis's electric keyboards and Peter Franche's funky bass lines provide a tight musical combination.Korda will take you on a musical journey through a diverse range of original and contemporary tunes and songs that will have your heart soaring or make you want to get up and dance. Welcome to the soothing, gentle sounds of Clairisma. 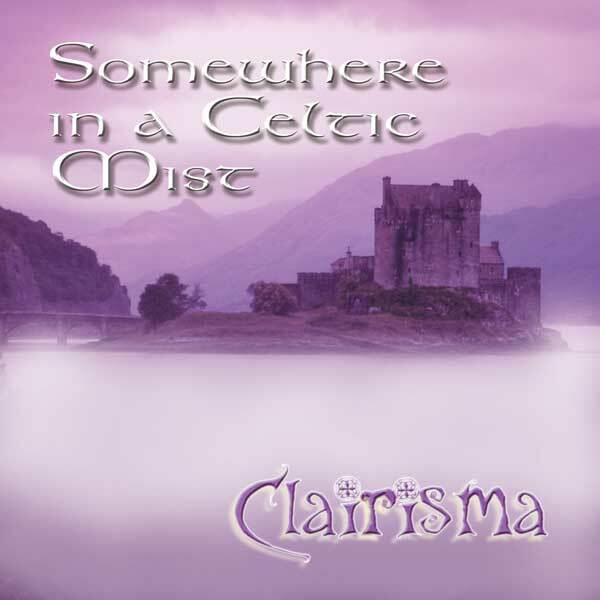 This original, contemporary Celtic music with medieval influences features haunting vocals and lush harmonies wrapped in layers of keyboards, whistles and pipes reflecting our Celtic heritage. Choir like vocals are accompanied by the following instruments: Acoustic guitars, bass, grand piano, Hammond organ, mellotron, harpsichord, keyboards, A Bb and C Irish whistles, shawm, Scottish smallpipes A C and D, low whistles D and F, flute, recorder, button accordion, bodhran, percussion and drums. If you enjoy the music of Enya, Blackmore's Night or Capercaille this is an album you will enjoy. An exciting new album featuring hurdy gurdy and nyckelharpa in range of styles from folk though to African, jazz and contemporary compositions. In every tune we hear the hurdy gurdy and nyckelharpa accompanied by a mind blowing array of instruments including concertina, guitar, cajon, fiddle, bouzouki, button accordion, bendir, percussion, saxophone, flute, sopranino recorder, descant recorder, tenor recorder, bassoon, clarinet in Bb, viola, piano, harpsichord, piano accordion, cello, double bass and percussion. A collection of new songs based on the experiences of Australian soldiers on the Western Front during World War One ~ written and performed by Rita Lindsay and Flo Bourke. The album features acoustic guitars, electric guitars, piano, drums, Yidaki (didgeridoo), boomerangs, bass, hammond organ, mellotron, accordion, keyboards, highland pipes and vocals performed in English and Ngarrindjeri languages. The album follows in the footsteps of the young Australian soldiers on their way to the Western Front in 1914 - 1918. Stories unfold of their excitement, their farewells, then the unexpected assault of trench warfare, the loss of innocence, leave, hospitals, death and demobilisation. The album seeks to capture as a moment in time each of the stages in these young men's lives. Roddy Gordon is a Scotsman who has been in the music business in Scotland, London, Sydney and now the Adelaide Hills for many years. He has a stunning blues voice, somewhere between Joe Cocker, Jimmy Barnes and Ian Anderson of Jethro Tull fame. Also a great guitarist, this album showcases a range of acoustic and electric guitars, harmonica, bass and drums in styles from folk to slide to root and blues. Moira Lawry is Australia's premiere Celtic harpist and this CD is a beautiful, gentle and relaxing journey into classical and Celtic music. A gorgeous recording and performance, this CD has been featured on ABC radio across Australia and has been her fastest selling album. This is Moira's first album with us, but her sixth album overall. This is the second album from brilliant Scottish fiddle player Linda Rankin, but unlike the first album this CD features a vast array of instruments and styles. Stunning bagpipe and fiddle reels are contrasted with dreamy vocals amid lush keyboards with quirky jazz and Eastern melodies popping in and out. 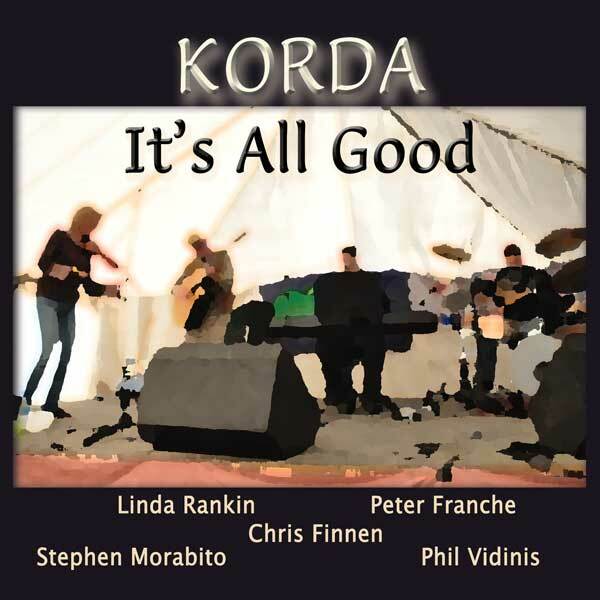 If you enjoy Capercaillie, Enya, Wolfstone or Cotters Bequest you are going to love this! The long awaited solo album from the composer of Australian Progressive Celtic ensemble "Cotters Bequest". The album sits very comfortably in the genre of Symphonic Progressive music and features swirling Mellotrons, Minimoogs, Hammond organs and Prophet synthesisers in a soundscape of moody introverted lyrics, soaring solos and haunting rhythms. This is a concept album telling the true story of childhood friendships, the descent into depression, revival, renewal and new life. In the best musical traditions of early Genesis, The Moody Blues, Pink Floyd and Peter Gabriel and continuing in the style of Porcupine Tree, Spock's Beard and the Flower Kings. The debut album from one of Australia's newest Celtic bands. An exciting mix of original and traditional pieces featuring piano, keyboards, accordion, trumpet, fiddle, 6 & 12 string acoustic and electric guitars, darbukas, djembe, African talking drum, clay pot, berimbau, caxixi, tanpura, conga, and rich vocal harmonies performed in Scottish Gaelic, Yiddish and English languages. Featuring blues guitar legend Chris Finnen, Scottish fiddle sensation Linda Rankin, English session trumpeter Ian Dixon, English keyboard wizard Richard Chew and classical soprano Cheryl Pickering. The long awaited third album from Australia's progressive Celtic ensemble. A Celtic history of South Australia, this album features the same group of musicians who appeared on the previous two albums. The new CD explores the journeys of two Irishmen Michael O'Loghlen and John Henry Cahill from the first arrival at Port Adelaide in 1854 until the last death in 1911. The album visits the Celtic communities in which they lived and worked - Irish shanty towns, Cornish miners, Welsh smelters and Scottish shepherds, as well as examining the ways of life of teamsters, farmers and the Aboriginal clans of the Parnkalla and the Peramangk. The musical styles covers a broad progressive spectrum from Gaelic choirs to roaring reels, each track featuring the unique and distinctive Cotters Bequest sound: soaring melodies, lush vocal harmonies and a vast array of 33 instruments including Highland, Uilleann, Northumbrian and Scottish Small pipes. ".....a Celtic King Crimson, .... a smooth Clannad, Capercaillie & Wolfstone.... with a sprinkling of Peter Gabriel"
The debut solo album from one of Australia's best Uilleann Pipers. An exciting mix of traditional, classical, popular and original tunes featuring uilleann pipes accompanied by keyboards, guitars, oboe and percussion. Jack also is the Uilleann piper with the pan Celtic band "Cotters Bequest". A magical album weaving ancient Celtic myths and legends of Llywelyn, Merlin and Cuchulainn amid dreamy landscapes of Celtic goddesses, festivals and eulogies underscored by a positive toe-tapping celebration of life. This debut album from a gifted songwriter features Celtic inspired songs woven in a tapestry of guitars, keyboards, Irish whistles, Highland pipes, violins, flutes and percussion. If you like your music to have a portion of Capercaillie, a taste of Kate Bush, a sprinkling of Peter Gabriel, with a waft of acoustic Led Zepplin - then this is an album you must hear. Well it's taken a while, but finally the long awaited follow up CD from Loch'rien has arrived. Following the highly successful and haunting debut album "Ancient Lands", the new release features the original members of Loch'rien with 14 new original songs. This is the gentle sounds of Australian contemporary Celtic Folk music whose haunting vocals wrapped in whistles and highland pipes reflect our Scottish heritage. Linda Rankin and Rita Sinclair-Wood are Australia's latest fiddle and piano discovery. This debut album is a beautiful collection of traditional and contemporary tunes for the Scottish fiddle accompanied by Grand Piano, Highland Pipes, Dijeridu, Keyboards, Bodhran and Jembe. If you enjoy the playing of Alisdair Fraser, Natalie McMaster or Laura Risk - then this is a CD you will enjoy. A new CD from one of Australia's most creative rock bands. The Loving Tongue are proud to announce the release of their third album "Distant Dreams" a studio double album fusing elements of progressive metal, epic rock and world music and featuring vocals in English, Latin and Slavic languages. "Distant Dreams" contains a vast array of instruments including vintage Prophet and Arp synths, Irish whistles and zither all complimenting the power trio format of guitar, bass and drums. A new CD from one of Australia's most gifted exponents of the Scottish fiddle. Catherine Fraser and Duncan Smith are two of Australia's most exciting fiddle and piano duos. Having performed extensively in Australia, New Zealand, Canada and the USA they have recorded their first CD. This is a beautiful collection of traditional, contemporary and original tunes, tastefully arranged and exquisitely performed. Those of you who regularly compete in freestyle dressage competitions will know the importance of the well recorded and professionally presented soundtrack for your performance. The ability to tailer the tempo of the music to suit your horse in the walk, trot and canter sections of your competition may well help you gain that competitive edge. Locrian Records offers professional freestyle dressage recordings of your music from as little as $AUS80. At last! - a collection of oratorios that have made Robert Dawe Australia's most highly regarded bass baritone. Composers include Haydn, Handel, Mendelssohn and Bach and feature "Elijah", "St Matthew Passion", "Messiah", "Creation", "Joshua", "Samson", "Seasons", "Cantata 142", "Dettingen TeDeum" and "Acis and Galatea". The CD also features the superb keyboard skills of Ashleigh Tobin, Australia's most respected organist. 53 minutes of sheer power and beauty for $US15, £9.70, $AUS25 including packing and first class airmail to anywhere in the world. Now you can record and release your first CD, you lastest album, an EP or simply a promotional CD from $AUS600 including recording, mixing, mastering and 50 professionally produced CDs. Banjo Frog Studio, the recording arm of Locrian Records, have now announced short run CD packages that allow bands, solo artists and composers to get their music out into shops, on the internet and into people's record collections at a price everyone can afford. A collection of beautiful, original songs from Australia's most innovative Celtic ensemble. Cotters Bequest has now released their new CD "Celtic Meditation"which contains vocal and instrumental tracks performed in Irish, Scottish, Manx, Cornish and English languages. If you like lush vocals, rich harmonies and haunting atmospheric music - have a listen to this album. On sale now. After numerous requests from pipers for an album of bagpipe tunes, Cotters Bequest has now released their new CD "Bagpipe tunes for the 21st Century". The CD contains instrumental tracks for the bagpipes ranging from waltzes to reels to reggae with pieces for pipes and string quartet, vocal ensembles and rock bands.